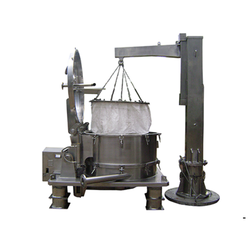 Catering to the varied requirements of clients, we are offering a comprehensive range of Four Point Bag Lifting Top Discharge Centrifuge Machines. The offered centrifuge machines are manufactured by our proficient personnel, who ensure these are based on latest technology and carry out the process of liquid separation without any hassle. These bag lifting discharge machines are manufactured using highly advanced machinery and latest technology in strict adherence with the highest quality norms and standards. Looking for Bag Lifting Top Discharge Centrifuge Machines ?